The best way to recover from a torn calf muscle is by protection, rest, ice, compression, and elevation (PRICE). If treated properly, it can take up to three weeks to heal Grade 1 calf pulls, four to six weeks to heal Grade 2 muscle strains, and three to four months to heal Grade 3 tears. Though this type of injury can heal on its own, it’s important to get a medical evaluation from a trained professional first before beginning treatment. Muscle tears or strains are caused by undue pressure that usually occurs during physical activity. This damage results in a partial or full tear of the muscle fibers and attached tendons. This can sometimes damage small blood vessels and cause localized bleeding, bruising, and pain as a result of irritated nerve endings. Grade 1 symptoms include a cramping sensation, tightness, and slight pain when the calf muscles stretch and contract. Symptoms won’t be recognized until the individual stops the activity that caused the pull. Grade 2 symptoms include immediate pain (especially when stretched or contracted). Bruises may also appear where the muscle was strained, causing the area to be sore to the touch. Grade 3 symptoms include an immediate burning sensation and stabbing pain that prohibits your ability to walk. You may see a lump or depression in the calf muscle where the tear occurred. A large bruise will appear on site. If you think you or your child have a calf muscle injury, visit your nearest FastMed Urgent Care to have a medical professional evaluate its severity. Depending on the grade of damage, there will be a longer recovery period and potential for physical therapy in more severe cases. 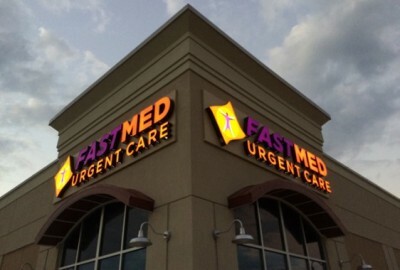 FastMed is a network of urgent cares throughout North Carolina, Arizona, and Texas that has extended hours and never requires an appointment. To find a FastMed near you, search for a FastMed by state.